I decided to do some more lore revision tonight. I had to stop partway through Neritum, but I thought I’d share the initial results. I also recently posted up another lore recruitment thread; we should be getting some reinforcements for our intermission lore team shortly, which will help us to finish up the rest of this, including the two issues of the Herald that we’d like to fit in. For reference, there will be about 22 Nyroth lore updates when all is said and done, including Lore Event VI. Yeah, I know: Why didn’t we just say there were SIX islands? 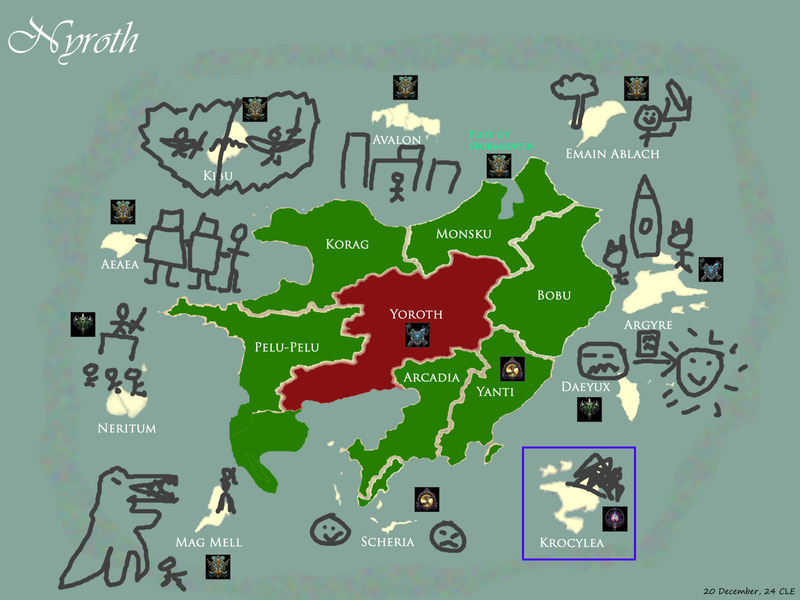 An airship expedition travels to the island of Nyroth and reports back. A brief interactive lore event following the prologue. In this event, each faction selects a starting Research project and makes some other decisions. A brief introduction to the Harrowing season. The Freljord recruits Trundle by petition and wins Udyr’s allegiance on the Fields. Nami hires the mysterious mercenary known as Jax to fight for Bilgewater. Bilgewater liberates an island from berserk hextech automata. The Harrowing comes to Runeterra. The Shadow Isles discover an island of undeath: and necromantic forces beyond even their control. Bilgewater restores a verdant island to prosperity, and gives Maokai hope of one day revitalizing his home in the Isles. The Freljord pursue automata spotted on the mainland of Nyroth. This is where the jokes about Ionia and libraries come from. Not all island have to be sinister. This one has sunshine, parties, and fruity drinks, as well as plentiful vowels. The Freljord discovers a splinter civilization of “prehistoric” yordles, worshipping their own Mothership. Remember the crabs? This is where they came from. Ionia decides to check out some more books. What could go wrong? The mighty warriors of Avarosa versus tiny little yordles. The Shadow Isles does battle with Kaius, the Millennium-Tyrant of Neritum. I’ve created a forum discussion thread here. Can anyone inform to me what updates are from the First Loresplosion, and which updates are the new ones? This would be greatly appreciated. The first Loresplosion was 1 through 10. Ok thank you good sir.